Well, I promised a pompano report and here it is. I just returned from Middle Cove Beach after fishing this afternoon with my wife Deb and son Randy. I am happy to report that the pompano were there and definitely chewing. The bad part is that after catching 40 plus pompano we are still looking for the first keeper. We definitely had some great practice on these 8 to 10 inch fish and Deb actually caught her first triple header on a 3 hook rig I am experimenting with that was baited with 3 pieces of EZ Flea Fishbites. I am sure as the calendar moves along this month the bigger pompano that are being caught north of us will move into the area. 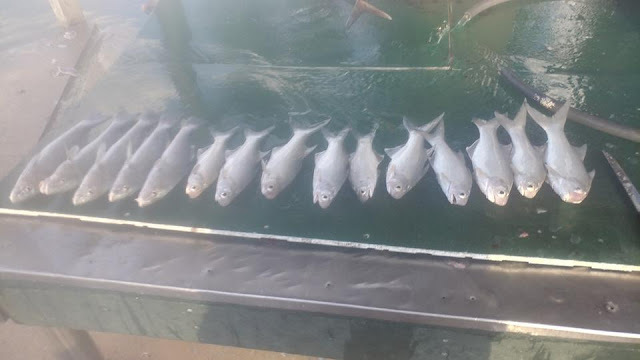 Randy fished at Stuart Beach early this morning and had a ball casting a krocodile spoon to schools of bluefish and jacks that were spread up and down that entire area of beach.